Alabama and Washington D.C/Maryland offer many programs that serve children and families. Below is Outcome Data from 1998 to May 2017 by Seraaj Family Homes, Inc. and its Specialized Foster Care Program. The data below shows the total number of children that had a successful discharge. The data below shows the total number of PFT who adopted children. As companywide, 146 PFT are adoptive homes. Eighty nine (89) of the PFT adopted one (1) child and fifty seven (57) adopted more than two (2) children. 1407 children were admitted into other programs (MF, MIP & Others). 262 children were adopted – Note: (81%) children were adopted by SFH, Inc.’s PFT. SFH, Inc. served a total number of 97 children with Special Needs. The graph below shows the total number of children with Special Needs by year. 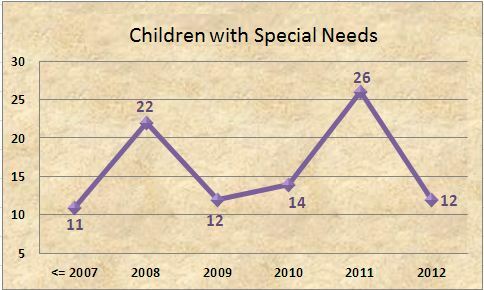 According to the graph, the maximum number of children with Special Needs served was during the year of 2008 and 2011. 36 (31%) Children were adopted, reunified or emancipated and 34 (30%) children were unsuccessfully closed. 52% of special needs children are successfully discharged. In 2006, Seraaj Family Homes, Inc. (SFH) was selected by the Alabama Department of Human Resources (ADHR) to participate in a permanency pilot in Jefferson County, Alabama. The focus of treatment was to establish a permanent, safe and nurturing family for every child in the program. Each child had been in out-of-home care for extended periods of time due to their needs or the needs of their parents, which in most cases were psychological, physical, behavioral or substance-abuse related. After a successful pilot, SFH awarded a second permanency contract in 2008. The contract was expanded to include both reunification and preservation services in Jefferson County and several other Alabama counties. 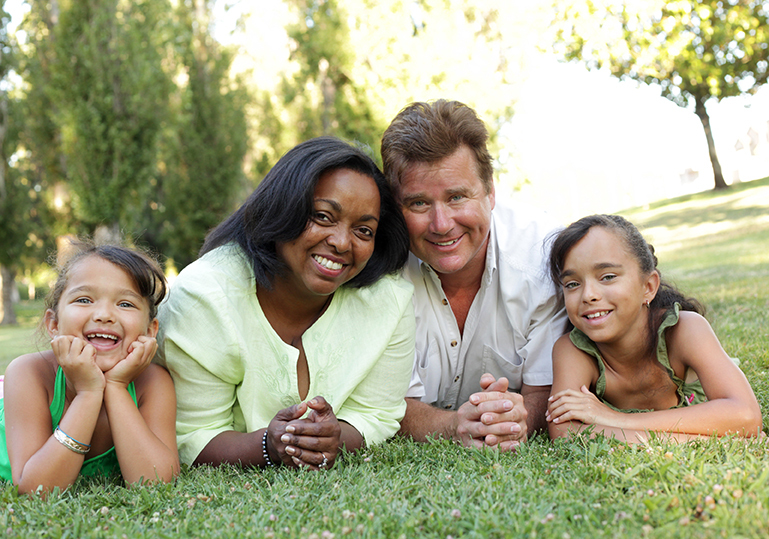 The permanency program provides intensive in-home services to families to facilitate the transition of youth that are ready to return home or to another permanent living arrangement from their out-of-home placement or to maintain children in their own home, when there is a possibility of imminent disruption. Also in 2008 SFH, was awarded a contract by ADHR for Continuum of Care (COC) Services. In the COC program, SFH provides intensive services to families and children to prevent out–of-home placement. When out-of-home placement is necessary, we work to achieve a less restrictive and less intensive level of care while providing intensive services to the family and the child in order to expedite permanency for the child. In 2011, SFH was awarded a contract by ADHR for the Permanency Reunification Continuum (PRC). SFH was granted 62 slots to address permanency needs for children and families across the state of Alabama. The contract requires SFH to maintain an 82 percent success rate with reunification within 1 year. SFH provides intensive in-home services in a direct, face-to-face format to facilitate the transition of the children from their out-of-home placement to their original home or to another permanent living arrangement. In 2017, SFH was awarded a contract by ADHR for the Intensive In Home Services (IIHS). SFH was granted 61 slots to address permanency needs for children and families across the state of Alabama. The contract requires SFH to maintain an 82 percent success rate with reunification within 6-9 months. SFH provides intensive in-home services in a direct, face-to-face format to facilitate the transition of the children from their out-of-home placement to their original home or to another permanent living arrangement. To date, SFH has served 538 children and families in our Permanency Reunification Continuum program, and has discharged a total of 455 children and families. SFH has taken 387 children and families out of the system’s care and helped them return home and/or achieve permanency. Our collective permanency success rate is 85 percent, which exceeds the contract requirement set forth by ADHR. The average length of service for consumers is 204 days or less than 7 months. This is a huge achievement for Alabama’s children and their families.